When my kids were little, we took a Mother’s Day camping trip. My husband told me not to do anything. He and the kids would pack, plan meals, and even set up camp when we got to our destination. While I was sure everything would go fine, I still had my doubts. So, the day we arrived at camp, my husband unpacked the car, and set everything up like he said. When dinner time came around, he told me to sit by the fire, and enjoy a glass of sparkling cider. While I heard all sorts of noises coming from the camp kitchen, all of a sudden my son appears with a plate of mozzarella and pesto crescent tarts for me to enjoy. As I consumed my Mother’s Day dish, I could see little fingerprints in the dough that did not bake out. I treasured each and every one of them. They represented how hard they worked and as I consumed them I realized that these little indentions would forever be a part of me. While I have had many Mother’s Day celebrations since then this camping trip was one of the best. Pop open the crescent rolls and separate into two rectangles. Place on parchment paper so that each rectangle is one to three inches apart. Seal the seams and roll out the dough until you get two rectangles that are 10-by-3-inches. Form a lip of dough around each rectangle. Add one tablespoon of pesto on each rectangle. Spread the pesto so that it reaches the lip. Seed and slice the tomatoes. Divide and put on each rectangle of dough. Thinly slice the red onion and distribute onto the rectangles of dough. Chop one to two teaspoons of fresh rosemary or measure out ½ teaspoon of dried rosemary and sprinkle on top of the dough. 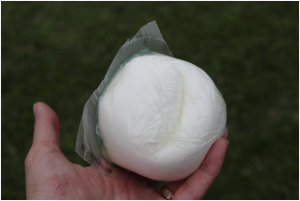 Cut up fresh mozzarella or simply sprinkle shredded mozzarella cheese on dough. The amount is up to you. Grate fresh parmesan cheese and sprinkle on top. Put parchment paper with dough inside a 12 inch Dutch oven. Top the 12 inch Dutch oven with lid and move to a heat resistant surface. Place the Dutch oven on top and cover lid with prepared coals. Once the cooking time has passed, knock off the coals from the lid, remove the Dutch oven from the ring of coals, and lift the lid. Remove the dough by lifting up the parchment paper, cut each rectangle into six pieces and serve.